Noeska is now the matriarch of Estrik Kennels and is retired from showing. 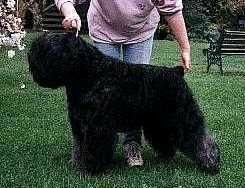 In her time in the show ring Noeska did extremely well, carrying the Estrik prefix with typical Bouvier character and humour, winning under both International and Australian judges. She is the mother of Aust Ch Estrik Steffi ( and the others in our "S" litter) and one of our more recent litters the "W" litter. Noeska is also grandmother to the "Y" litter.